MainAll NewsJewish WorldNapoleon: A Modern-Day 'Messiah'? Auction find reveals that the dictator drove to give full rights to French Jewry, fashion himself as the savior of Jewish life there. 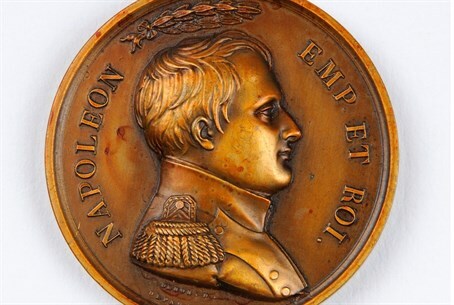 An antique rare medal up for auction Wednesday at Kedem Auction House in Jerusalem provides a rare peek into the relationship between Napoleon Bonaparte and the Jewish community in France. 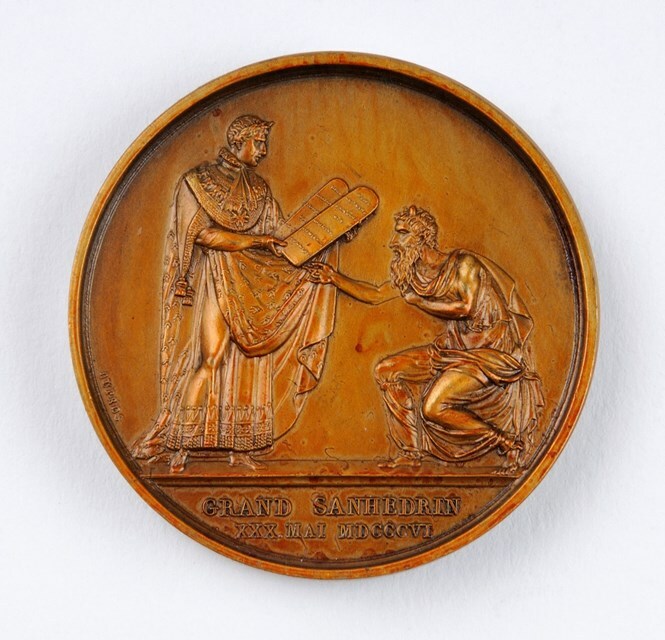 This medal was issued more than 200 years ago in honor of the "Grand Sanhedrin" convened by Napoleon. 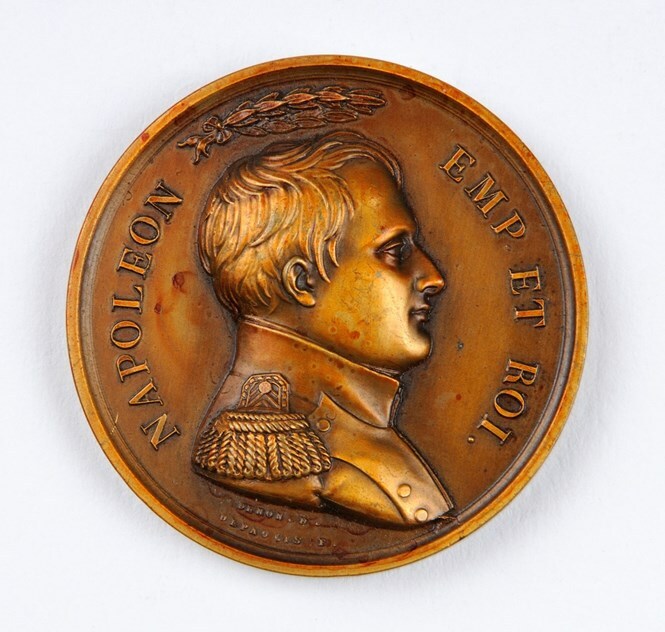 A portrait of Napoleon appears on one side of the medal surrounded by the inscription "Napoleon, King and Emperor." On the other side, Napoleon is portrayed in imperial dress, granting a kneeling French Jew the Tablets of the Ten Commandments. Inscribed under the figures are the phrase "The Grand Sanhedrin" and the date Napoleon announced its convention - May 30, 1806. The "Grand Sanhedrin of Paris" is one of Napoleon's lesser-known initiatives. Historians claim the legislative body was established by Napoleon for two purposes: to supervise the Jews on the one hand, and to gain their support and goodwill on the other. Napoleon aspired to grant France's Jewish population the status of full citizens, with equal rights and obligations. The opportunity finally arose in 1806, when grievances against the Jews began to surface in the Alsace Region claiming that Jewish moneylenders were "exploiting the non-Jewish population." The public debate surrounding these complaints brought Napoleon, in July 1806, to convene Jewish leaders from all over France to constitute a new legislative body. The body would, ideally, enforce Jewish legal principles which would enable them to adhere to their beliefs while living as faithful French citizens as well. To drive the point home, Napoleon modeled this body after the traditional Jewish legislative assembly: the Sandhedrin. He called convention of 71 rabbis and Jewish leaders which he called "The Grand Sanhedrin," in imitation of the historical Sanhedrin whose task was to approve the assembly's decisions, and imparted upon them greater autonomy and power than the French Jewish community had ever experienced until then. Although "The Grand Sanhedrin" reached the decisions Napoleon desired - which balance the Jews' religious obligations and their obligations as French citizens, prohibited lending money with interest to non-Jews, and even declared Napoleon "the man who does wonders, is compassionate and good, pursues loving-kindness, who removed our shame" - the body also managed to preserve Judaism's basic laws and principles. Historians note that to maneuver between Napoleon's wishes and Jewish law, the members of the Sanhedrin chose to use ambiguous wording in French. "The Grand Sanhedrin" eventually became the basis of the establishment of the French Consistoire, which constituted and still is a central element in the lives of the French Jewish population. Eren noted that the find provides a reminder of the "Grand Sanhedrin's" intent, however - to fulfill a dictator's dreams. "The medal is distinct for two main reasons: It relates a fascinating tale which sometimes seems to be the fruit of someone's imagination and it depicts the manner in which an event which took place hundreds of years ago, continues to impact us until this very day," Eren concluded.